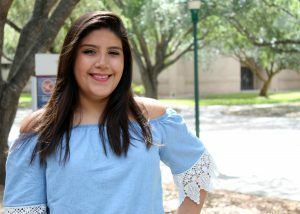 (HARLINGEN) – Arleth Olvera is an Engineering student at Texas State Technical College. The Brownsville native holds a 3.8 grade-point average and expects to graduate with her associate degree Spring 2019. The 19-year-old said she is grateful that she can study what she loves close to home, at a college where the programs are exciting and the hands-on training in invaluable, all while still being able to help take care of her younger brothers. When I graduate I hope to transfer to the University of Houston or University of Texas at Dallas to pursue a bachelor’s degree in Mechanical Engineering. Since I was young I’ve been fascinated with designing, drawing and building things, so I hope I can build a career in engineering and architecture and show other women, especially young girls, that we can succeed in a male-dominated field. I have dyslexia, so school and learning has always been difficult for me. Not many people thought that I would finish high school or go to college, but here I am. So, my greatest accomplishment so far has been showing those who didn’t believe in me that I can do whatever I set my mind to and I will not stop until I make my dreams come true. The greatest lesson I have learned is that the only person who can let me down, is myself. I have learned to not give up and keep trying until I succeed. Anything is possible. My best friend Karla Dalet Ramos, who is studying Education and Training at TSTC also, is my biggest influence. She has shown me how to be free and open with my thoughts and opinions and how to have fun and enjoy life. My advice for future TSTC students is don’t skip class, study hard, work hard and don’t give up on your dreams. If you can dream it, you can achieve it.